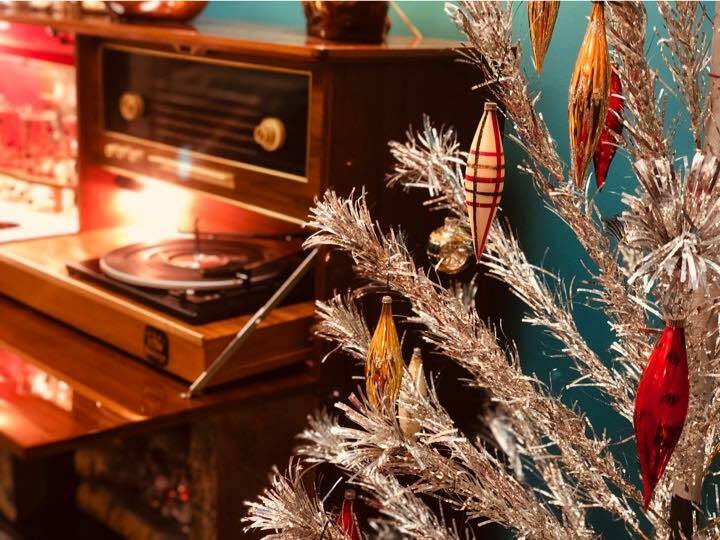 We assembled this Mid-Century Modern Christmas vignette at Avonlea Antiques & Interiors to create a retro Christmas vibe, and share details from the unusual pieces we selected. Discover Mad Men ambiance in an entertainment cabinet. What could be more intriguing than a full-service system at your fingertips? This fabulous concept comes from the Koronette Company of Germany, which offered a number of versions of their entertainment centers. The resplendent piece provides the user with four elements in a sleek modern console crafted in golden mahogany with a high lacquered epoxy. Drop-down doors at the top and twin doors at the base reveal riches galore. A stereo AM/FM radio with short wave capability and a lighted turntable lie behind the top door on the right. The top left door opens to a lighted bar area with glassware storage. Of course, both the bar and turntable pull out for easy access. A faux fireplace, with an optional rotating light, simulates a crackling fire. Doors on either side of the hearth house speakers and vinyl record storage. So, cozy up to a relaxing evening at home amid all these elements for a mid-century kind of night while Dino or Frank serenade you. 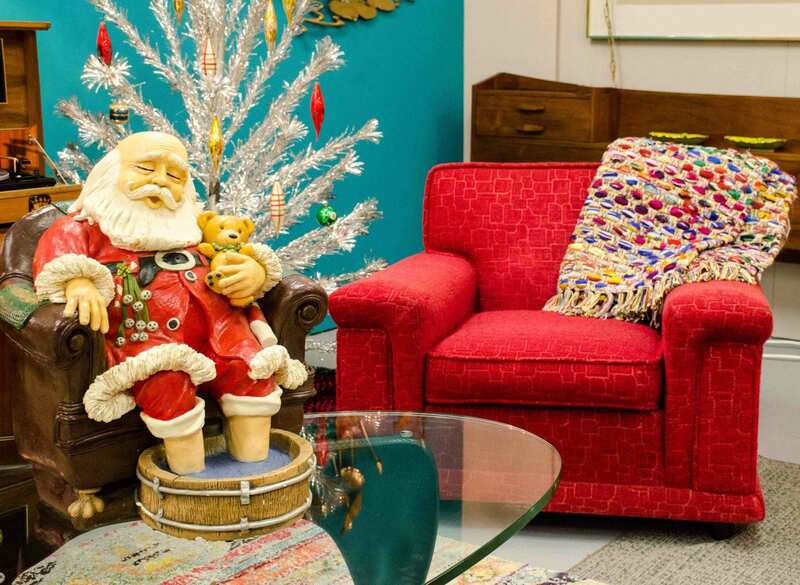 This snazzy, Santa-red lounge chair from the 1950s exudes comfort. The oversized structure’s wide arms offer stability with attitude. Upholstered in an iconic Hollywood Regency fabric of the era known as freize, the nubby, looped nylon fabric perfectly suits carved, scrolled and geometric patterns. Our lounge chair presents a subtle geometric squared brick pattern, which the overall design enhances. The low profile, broad shape, and the textural upholstery all form attributes of great Mid-Century Modern design. Manufactured by Kroehler of Naperville, Illinois, the second largest furniture manufacturer by the 1940s, the original label remains intact on the chair seat base. George (Isamu) Noguchi’s Coffee Table, introduced in 1948, represents one of the prolific sculptor’s few incursions into mass production and furniture design. The tripod table, understated with its curved, ebony wood base and thick glass top, creates an ethereal yet sturdy design element. The backstory of this sculptural table involves racism and revenge. In 1939 Noguchi encountered British furniture designer T.H. Robsjohn-Gibbings in Hawaii and provided a mockup design of a plastic three-legged table. Returning to the States, he heard nothing more about this. Lives turned upside down when the Japanese bombed Pearl Harbor in 1941. As the U.S. government shipped Pacific Coast Japanese Americans to desolate internment camps, Noguchi volunteered to join them. He traveled to Arizona, settling into a sweltering tarpaper barracks with an agreement to develop arts-and-crafts training programs for the residents. His designs for swimming pools, baseball fields, and irrigation systems within the camp – to make life more bearable – never achieved reality. Incensed, Noguchi decided to create a better three-legged table – and his revenge brought forth the 20thcentury’s most recognizable table design. Herman Miller Furniture still manufactures Noguchi’s original design, but there are always reproductions available at a fraction of the cost. The popular aluminum Christmas tree of the 1960s, sparkling bright and almost intergalactic, now evokes warm nostalgia. The branches couldn’t support heavy ornaments, so lightweight glass balls, used sparingly, decorated the tree. Lighting came in the form of a rotating color wheel because traditional Christmas lights caused a fire hazard. Ironically, the demise of these trees is blamed on A Charlie Brown Christmas in 1965. Lucy’s demand for a pink aluminum tree became symbolic of the season’s excessive commercialization. Charlie Brown’s little tree emerged as authentic and heartfelt. What we love about Mid-Century Modern design goes beyond aesthetic appreciation of its form. Every piece arrives with a story. Discovering the stories enhances our delight.